It was Socrates who said “An unexamined life is not worth living” and recently I have completely re-examined the way I have been living my life. Well more specifically, I have re-examined my life in relation to the type of foods I have been eating, the types of cleaning and bathroom/beauty products I have been using, and the amount of waste I have been creating. I decided that I wanted to start eating much more naturally and reduce the amount of stuff I buy from the shops, and in particular processed foods, cleaning and beauty products. At this point I should mention that I am no Suzy homemaker, in fact I am quite dodgy when it comes to these homemaker type things. You can bet that if there is something that can go wrong with a recipe, I’m going to get it wrong! I’m as busy as the next person and don’t have much spare time so I tend to cut corners, I’m the kind of person who starts a recipe without reading it the whole way through and that rarely ends well! I have spent a lot of time trying to find the quickest, easiest and most cost-effective ways to go about the changes and, despite not having any natural ability for this stuff, and the whole “cutting corners” thing, I have managed some success. I think it would be fair to say that if I have managed some success with this stuff, then anyone can, and it is for this reason that this blog came about. The aim of this blog is to document my successes and (sometimes epic) failures in the hope that I can help to inspire other non-Suzy-homemaker types to make changes and to get on board the make-it-yourself train. The re-examination of my life came as the result of attending a number of workshops and watching a number of really interesting docoumentaries which really got me thinking about the power of food. A couple that I would highly recommend watching to start with are “Minding your Mitochondria” which is about Dr Terry Wahls who has completely cured her Multiple Sclerosis through changing her diet. “Genetic Roulette” which is all about genetically modified food and the impact it is having on people and animals and the environment. There is also heaps of interesting research being done on the gut bacteria and the impact this has on our health, “Live Dirty, Eat Clean” is one I watched early on, and recently Catalyst had a couple of episodes on the research being done in this area called “Gut Reaction“. Really interesting stuff! Now, not all the changes I am making involve making something, and in this, my very first blog, I wanted to share a couple of the very first changes I made, which require pretty much no effort and no recipes. The first is change your salt (well unless you are already using unrefined salt, in that case, please do not change your salt). Did you know that natural, unrefined Himalayan salt contains 84 nutrients that are vital for life? Did you know that by the time we have finished processing it so that it looks like the pure white stuff you may be used to buying, it contains none? That’s right, zero. Here are a couple of links to some information that I found interesting about salt. This one from the organic authority , and this one from the Wellness Mama . Basically, salt for eating, should NOT be white. It can be pink, red, black, or grey but it should not be white. White salt provides no nutritional value and actually contains harmful ingredients. But don’t go throwing out your white salt, you can use what you have left for cleaning (cleaning recipes to come!). The second thing is to use butter, stop using margarine. Did you know that plastic is made from oil? I didn’t, but it is, and at a workshop I went to recently I heard that the process through which margarine is made is similar to the one used to make plastic, and if they kept heating the oil during the margarine making process, it would become plastic. Well that sounds fairly disgusting to me. Now, I couldn’t actually verify this information through my research, but what can be verified though (and is the same as with salt) by the time we have finished processing oils to make margarine, there is no nutritional value left (well that is assuming there was some nutritional value to begin with and it is unlikely that this is the case given the types of oils they use to make margarine). Here is a link that outlines the process for making margarine from the All 4 women website, yep, fairly disgusting. 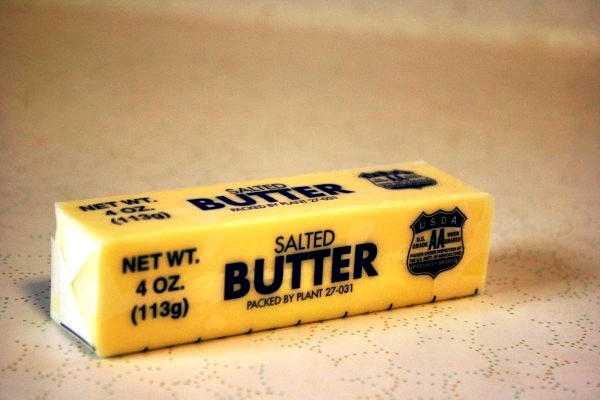 On the flip side there is increasing information around about the health benefits of butter, butter is full of all kinds of essential vitamins and minerals and has many health benefits. Here is an article from the body ecology website which outlines some of the health benefits of butter . One thing to note here, as outlined in the body ecology article (and this is the case with all dairy), try to go organic. You can grab a slab of organic butter from any of the major supermarkets for around $4. If not organic, then go with butter that is made from grass-fed animals. Here is a great article about grass-fed butter in Australia from the Optimoz website. Categories: Uncategorized | Tags: Butter, grass fed, Pink Himalayan Salt | Permalink. I feel the garden needs some work. Probably you haven’t had time with so much sustainability!! Yes Helen, it definitely does, luckily my mum is an excellent gardner so I will be getting her in to help me fill it with flowers (for those out there who dont realise, Helen is my mum 🙂 ) In my dreams, the garden is also filled with fruit trees and vines, vegetables, a couple of cows, sheep, a goat, a pig, some chickens and, of course, bee apiaries! Can I add Australian rock salt from Woolies leaves a much smaller carbon footprint than Himalayan but I am not sure of the mineral content. Lake rock salt too. Also the same with the butter. I haven’t used margarine for years. I buy Devondale products as they are owned by an Australian dairy farmers co-op and all locally grown. Again a smaller carbon footprint to NZ products, though I’m quite happy to support our Maori cousins. I love supporting Australian owned and grown as long as it is ethically managed. Skipping ahead I have been buying Country Life soap as palm oil free but have stopped as it now contains palm oil. Link below is a new venture. All natural skin products created by a friend of Monica. Sydney based and I think they are great to use. ps. I want to live in that little stone house………. Oh wow!-what a neat surprise to find your name at the end,Steph!-great work!-like finding Clark Kent is really Superman! Oh thanks Duane 🙂 I’m very happy if you enjoyed reading it! This is great stuff. And in easily absorbable chunks. Looking forward to more. I recently gave away one of those Himalyan rock salt lamps to a friend. I could have been using it as a salt lick!